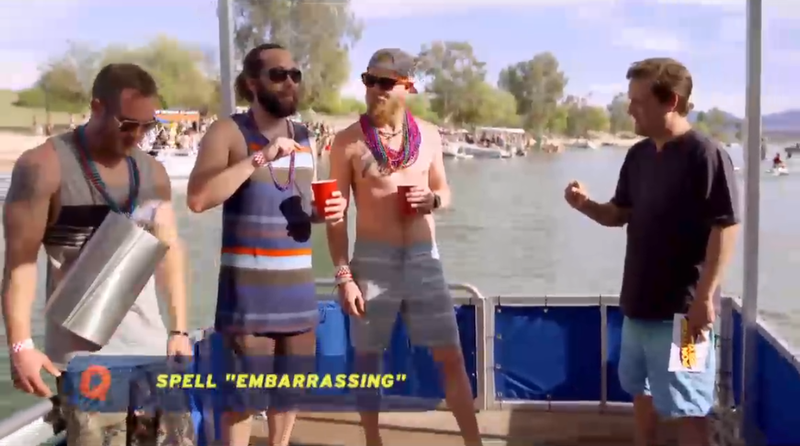 Quick Review of "Pontoon Payday"
Here’s how CMT’s newest game show works: Host Frank Nicotero surprises a group of unsuspecting contestants with a chance to board the Pontoon Payday boat and play a trivia game. The team must work together to answer three questions correctly. An incorrect answer earns team a strike. If the team gets two strikes, they must face a Punishment (e.g. : shocking their teammates with a taser, shaving off an eyebrow, eating worms etc.) to remain in the game. Three incorrect answers ends the game with the team leaving with nothing and three correct answers wins the team $500. Upon winning the $500, the team may choose to keep the money or play the double-or-nothing Cooler Challenge in which they must decide which of the two coolers is filled with cash to double their total to $1,000 and avoid the empty one that forces the team to leave the game with nothing. To avoid sounding terribly redundant from one of my most recent reviews on another game show with a similar format, I’m going to keep this particular review very brief. As I had similarly mentioned last week with Labor Games, Pontoon Payday is just another futile attempt to recreate an ambush game show to match or outdo the popularity of Cash Cab. It has the same entertainment value as Spike TV’s Repo Games with contestants humorously struggling to answer easy trivia questions with the exception of contestants completing humiliating stunts to remain in the game in this series. The sole bright spot in the show is host Frank Nicotero, who has proven to be a solid emcee in past shows including Street Smarts, and his excellent ability to keep contestants interested in the game through his laid-back personality and keen sense of humor. Other than a thematic lead-in to one of CMT’s more popular reality shows, Party Down South, there is very little reason to believe that CMT will hang on to this series for a long period of time. I foresee a one-season stay for Pontoon Payday. Watch new episodes of Pontoon Payday Thursday nights at 10:00pm and 10:30pm EDT on CMT!